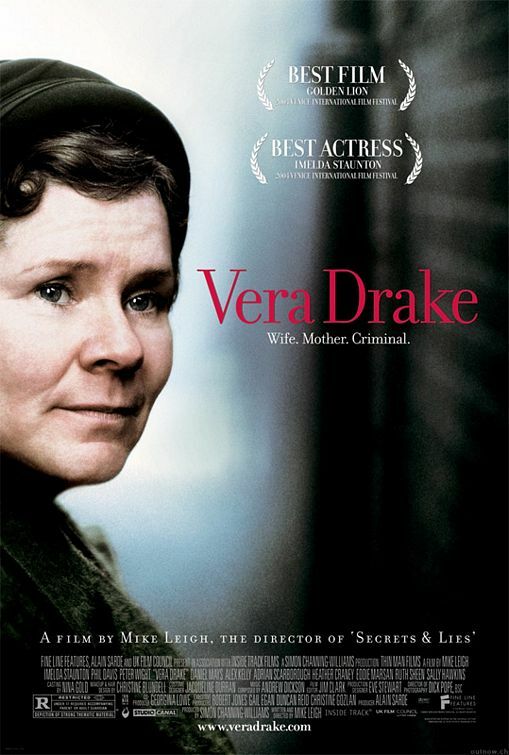 Vera Drake is an absolute masterpiece. It may seem an unappealing prospect to many, but the rewards it gives its audience are immense. This is a drama which is affecting, superbly understated and perfectly delivered in every way. Set in 1950, the film focuses on an absolutely lovely woman, the eponymous Vera Drake, who is a devoted wife and mother and is always looking out for people around the community. She also “helps young girls out” by performing backstreet abortions, unbeknownst to her family and friends. She believes that it is the right thing to do, but eventually the law catches up with her. Watching here in the UK, where abortion has been legally regulated since 1967, and where recent attempts to change the laws in parliament have fallen flat on their face, the debate is very much over. In the US, of course, it remains a hot-button issue. Though your sympathies are naturally with the lovely character of Vera, who is brilliantly played by Imelda Staunton, who fully deserved every accolade, nomination and award she received for the film, it is interesting to note that the film does not make a moral judgement about abortion. It has characters, some of whom you are sympathetic to and some of whom you are not, who briefly state both sides of the debate. It is not a preachy film. It recognises the complexity of the moral issue and how divided opinion is on it. However, what it does do is portray the hideous consequences of abortion not being regulated. The film makes it clear that, on all levels of society, abortions will be sought and that such things can be done safely (as in the case of an upper class girl in this film) or dangerously. That is a fact, and the film leaves you to make your own mind up about what that means for the debate. Abortion is the talking point of the film, and it is intelligently and sensitively handled, but the film works to its best degree as a human drama. The cast is exceptional and, under the direction of Mike Leigh, they improvise a script which is pitch perfect. It has a wonderful natural feel and delivers the feel of the early fifties superbly, greatly assisted by the carefully observed design and beautiful cinematography. There’s a lovely early scene which sticks in the mind where characters discuss their war experiences, making it clear as to how the effects of the recent war still linger: a delicate touch which hits its mark with precision. Supporting Stauton’s superb central performance are many great actors, some of whom were little known back then but have since become very famous. Phil Davis, Daniel Mays, Eddie Marsan and Sally Hawkins are all impressive, but the best supporting performance is from Peter Wight as DI Webster. His turn as the good cop is wonderfully delivered, and always keeps you wondering as to what he really thinks of the situation he find himself in. Leigh is one of the good guys: he always makes films with integrity and no-one could possibly accuse him of doing anything for riches. Here, he took on a difficult subject with due care and sensitivity and the result was near-perfection. He really didn’t put a foot wrong. Is 3D dying or has it merely stumbled?